In a fine dining restaurant, guests typically have 3-5 petit fours to finish a great meal. The chef will send these beautiful concoctions along with the check to ensure that the diner leaves smiling. This tradition allows pastry chefs to show their skill at balancing flavors in a small presentation. I like my petit fours to be modern, a little random, somewhat whimsical, and very quick and easy to produce. Enter rochers. “Rocher” is French for “rock,” and these craggy confections are made of chocolate and nuts. Start with your favorite chocolate and melt it gently (under 90F). Add your choice of nuts. The more nuts you add, the more rigid the final product will be. 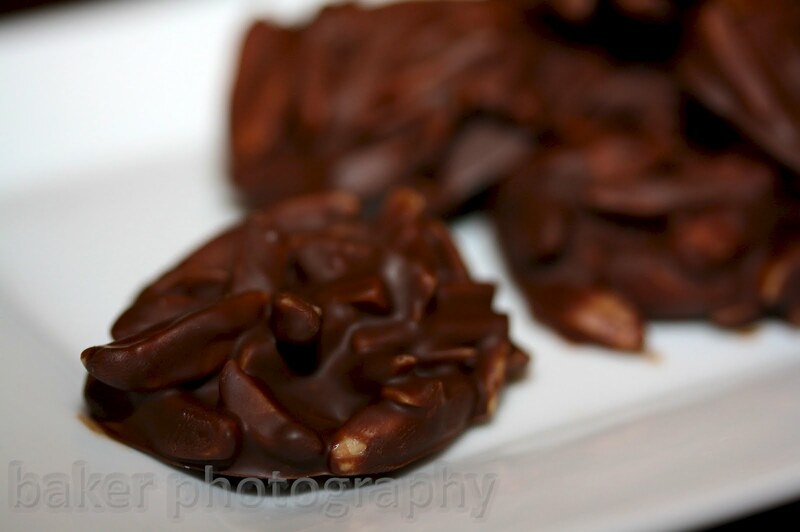 Toss the nuts with the chocolate until well coated and scoop onto a prepared surface. Let set until firm. Serve and enjoy. That’s it! I can think of no other petit four that requires so little effort and so few ingredients. There are endless variations: white, dark, or milk chocolate blends, plus crispy croquantine instead of nuts. You can even use molds to create different shapes. No matter what variation you choose, the preparation is easy and the results are a sure-fire crowd-pleaser. Previous post Best. Cinnamon Rolls. Ever.